There are some writing which remain in the pages of books, and then there are some exceptional writings which come out of the pages and center our life. The song Vande Mataram is of that exceptional kind. When we look back to that song published 130 years ago in 1882 and written even earlier, many questions crowd our mind. What accounts for that fact that it holds its place in national psyche so many years later? How did that song become a battle cry in the freedom struggle and part of national life in the pre-independence period? What inspired poets to translate it into all major languages and music makes from Rabindranath Tagore to A.R. Rahman in our times to set it to music? How was it recognized as a ‘national song’ after independence? Why has it been a subject of communal controversy in the decades preceding independence as well as today? Sabyasachi Bhattacharya revisits the fascinating story he told in a widely acclaimed book he wrote 2003. Sabyasachi Bhattacharya, formerly Professor of History at Jawaharlal Nehru University, and Vice-Chancellor, Visva-Bharati University, has also held teaching and research positions in St. Antony’s College at Oxford, University of Chicago and EI Colegio de Mexico. His recent publications included Rabindranath Tagore: An Interpretation (2011) and Talking Back: The Idea of Civilization in the India Nationalist Discourse (2011). He also edited Approaches to History: Essays in Indian Historiography (2011). This book began to take shape in 1994 when a number of conferences were held in India to mark the centenary of the death of Bankim Chandra Chatterjee. 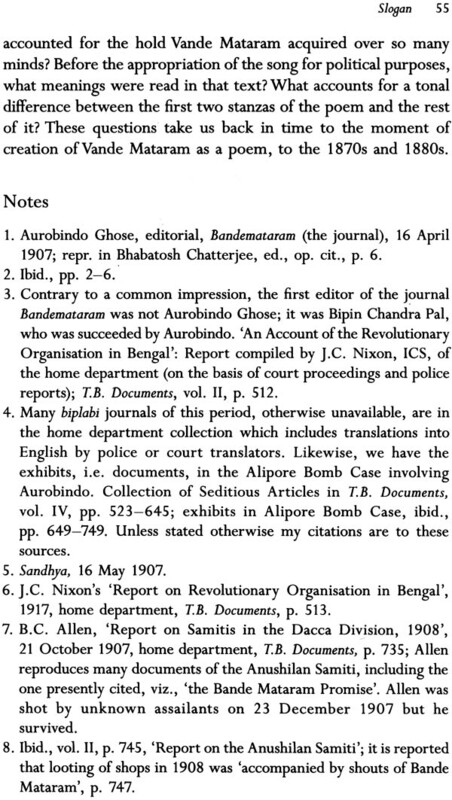 Some of these conferences were held in Bengal, and I was draw into participating in them since I happened to be working at that time in Visva-Bharati, Santiniketan. My notes, accumulated over time, took a certain structure when I delivered the Bankim Chandra Centenary Lecture at the Sahitya Akademi in New Delhi. 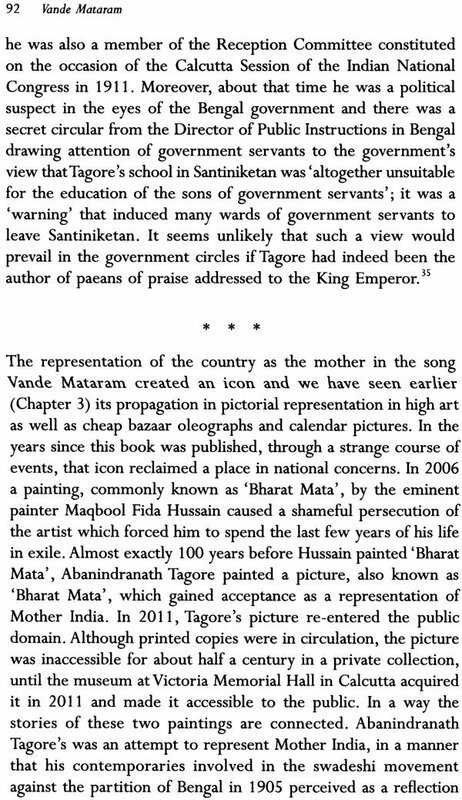 The song Vande Mataram emerged as a focal point of interest since the political appropriation or rejection of that one cultural artefact figures prominently in the discourse in our times. Discussions with my colleagues at the Centre for Historical Studies at Jawaharlal Nehru University helped a great deal in putting this book together. Dr Y. Chinna Rao helped in collecting some information on south India and some of the data for the ‘notes on personalities’ at the end of the book. Such notes, I thought, might be useful to readers who are not familiar with the historical background. Above all, while writing this book I have once again drawn upon the indulgence and patience of my wife, Malabika. It has often been said that there are some writing remain within the pages of a book, and then there are some exceptional writing which come out of the pages and enter our lives. The song Vande Mataram is a piece of writing of that exceptional kind. 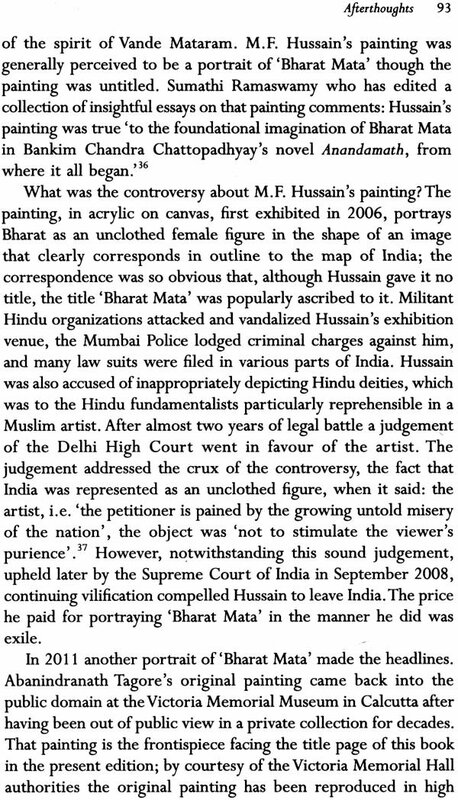 It has, on the one hand, been popularly acclaimed as India’s national song while, on the other hand, it has given rise to intense contestation on account of objections raised on the ground of its imagery and rhetoric, and implicit idolatry. Written in the early 1870s, the original version, a lyrical vandana or hymn, remained unpublished for some years. In 1881, it was included in the novel Anandamath, and in an expanded version, the poem was endowed with militant Hindu accoutrement in the context of the novel. Thus, Bankim Chandra Chatterjee created a new icon-the motherland. 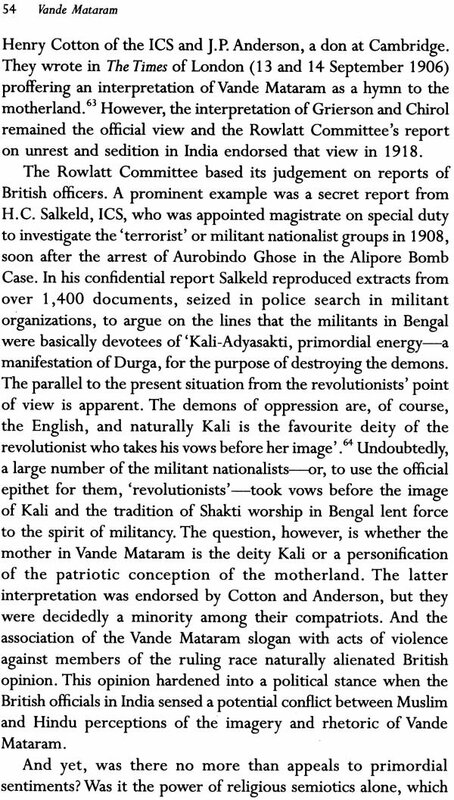 From 1905, the swadeshi agitation in Bengal converted Vande Mataram into a political slogan. Rabindranath Tagore sang it while leading the nationalist protest processions and Aurobindo Ghose hailed Bankim as the ‘rishi’ of nationalism. 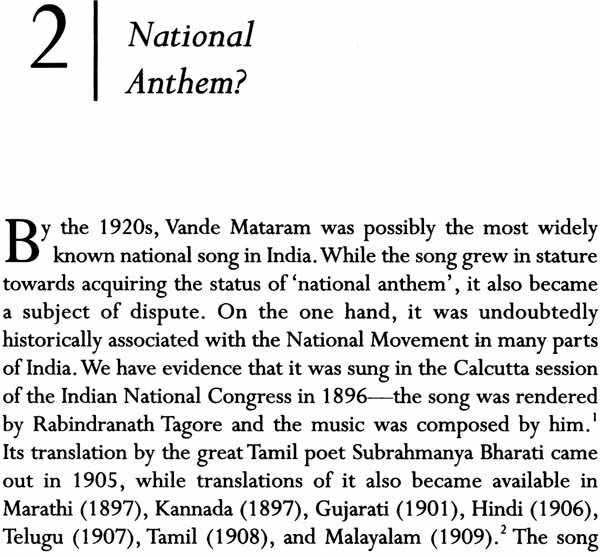 By the 1920s, the song, widely translated into many Indian languages by Subrahmanya Bharati and others, was acquiring the status of a national anthem. However, in the 1930s the status was contested because many in India began to object to it on the ground that it was idolatrous. M.A. 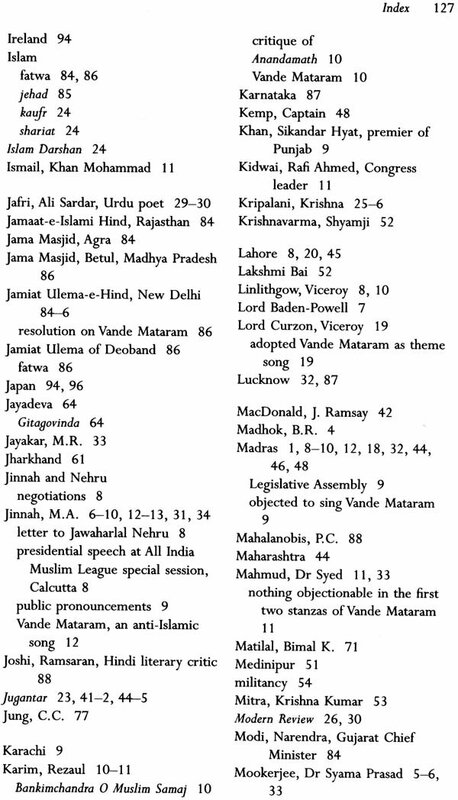 Jinnah was one of the most vociferous critics of the song In 1937, the Indian National Congress, guided by a committee led by Jawaharlal Nehru, expurgated the parts prominently highlighting the idolatrous characteristic and adopted a part of the text as the national song. In 1951, this version was adopted by the Constituent Assembly, at the instance of Rajendra Prasad as the national song, along with Jana Gana Mana, which was designated the national anthem. Throughout the 1930s and 1940s the Muslim League persisted in their opposition to the song, while the Hindu communal enthusiasm in its favour increased alongside. From 1947, Vande Mataram became a communal war cry in the perception of some Indians, while some others perceived it as a legitimate symbol of national cultural identity, thereby leading to conflicts on the status of the song. Thus, the political appropriation of Vande Mataram transformed its meaning time and again. 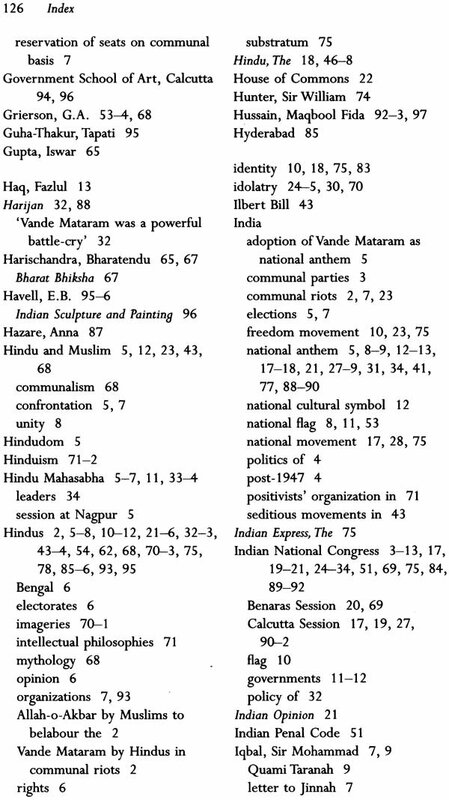 The instrumentalization of a piece of literature in the process of making national and communal identities, the ascription of different meanings at different points of the time, the differences between what it meant to, for instance, Aurobindo’s generation, and to Jawaharlal Nehru, M.A. Jinnah or V.D. Savarkar’s generation are some of the issues which emerge from the palimpsest of the many meanings inscribed on this cultural artefact, a song. Perhaps, one of these issues specially merits attention: that is the possibility of the infringement of the creative author’s autonomy by the political appropriation of his work and the role politician play in such infringement. Much later than Bankim Chandra, an author who confronted this question was Rabindranath Tagore. His answer to the question was a strident protest against the violation of autonomy and intellectual freedom. In a famous essay, ‘The Call of Truth’, he strongly articulated the importance of a refusal to ‘surrender the dignity of intellect into the keeping of others’ for India cannot attain true freedom unless it is recognized that ‘its foundation is the mind which, with its diverse powers and its confidence in those powers, goes on all the time creating swaraj for itself’. Bankim never faced this question because the political struggle over the song he created occurred long after his death. I have cast the story in a retrospective mode. A series of stories were often chronicled in the classical Sanskrit tradition (e.g. in the Kathasaritsagara) whereby a story opens the door into another and a chain of narratives is thus recalled. One of the reasons for doing so is to address the reader who is interested in the here and now in the first instance. The past opens its pages when you ask what brought about the situating here and now. Thus, we can interrogate history, not as a given set of facts but from the vantage point of a present that is itself a receding time horizon opening up possibilities of perceiving different perspectives and different memories of the past. Thus, our story takes us back step by step to the time when the song was written about 130 years ago. We begin the story by recalling some of the conflicts on communal lines which occurred in the recent past centring around the song (Chapter 1). 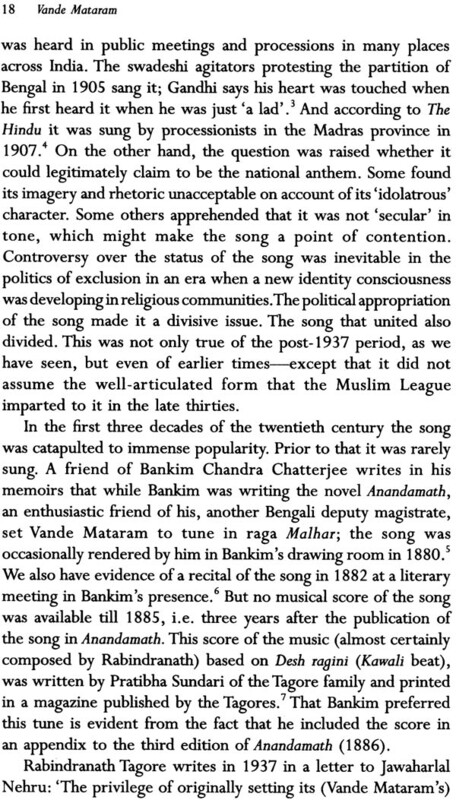 Then we go back to the pre-independence decades to see how he song acquired the status of a national song in the perception of many in India and how, at the same time, that status was denied by other (Chapter 2). Next we go further back to the early twentieth century when Vande Mataram became a slogan, a rallying cry, a vow of fealty to the nationalist cause (Chapter 3). And finally we look at the moment of origin of the poem and try and understand what the poem might have meant in the context of the 1870s and 1880s ( Chapter 4). To go back thus to the moment of creation in this manner does not necessarily privilege meanings read into it in the last decades of the nineteenth century. No such attempt to establish a canonical meaning will be free of cultural assumptions which are likely to be contested from the perspective of a different time horizon or historical conjuncture. That is not to say that everything dissolves into a welter of different possible readings of Vande Mataram. The interesting aspect of the story lies in the continuity and change in the dialogue between a text and the readers in different times and contexts. My attempt has been to historicize that dialogue. This is Worthwhile because Vande Mataram, the poem/song/slogan/war cry or a contested national anthem, has been a part of popular culture to this day. Whether one considers its various incarnations in the hand of composers ranging from Rabindranath Tagore (in the 1880s) to A.R. Rahman (1997), or one recalls its reported nomination among the two most popular songs in India by 25,000 listeners of the BBC World Service (2002), the song written 130 years ago remains mainstream cultural property in India. I have tried to answer why and how this happened.